The architectural design team was lead by BVN Donovan Hill and included landscape architects 360 Degrees, engineers AECOM and a team of sub-consultants. The construction was carried out by Hansen Yuncken and project management services were provided by Thinc Projects. How did the building’s design originate? 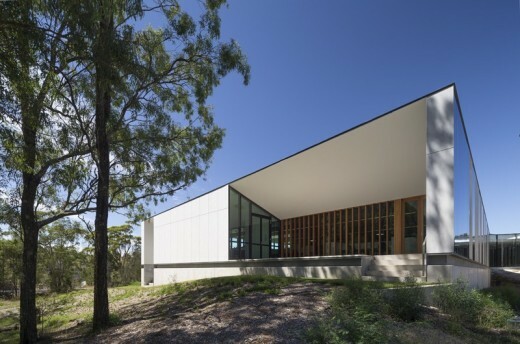 To enhance the visitor’s experience of the surrounding natural woodland and to associate the importance of the woodland to the activity inside the building, the approach from the visitor car park is a transitional experience from the motor vehicle to an embedding of the visitor in the natural setting of PlantBank. 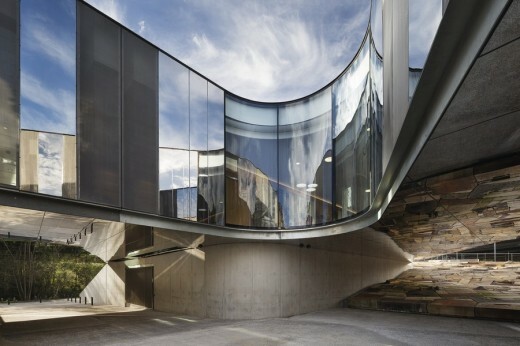 It is a definite cue that this is a building concerned with nature and sustainability. The need to position the building on the site’s upper level with existing buildings requires the visitor to ascend six metres from the road level to the building. To enable a ramp journey over this height the visitor moves under the footprint of the building and then continues, to the front door which is located opposite the woodland. The incision in the earth to enable this stroll ‘is further evidence of the nature metaphor – the moving between shadow and light, the entry to a cave or simply the idea of moving from the vastness of the Australian landscape into the intimacy of the forest. It is a journey from the terrestrial to the verdant’, said Mr Grose. 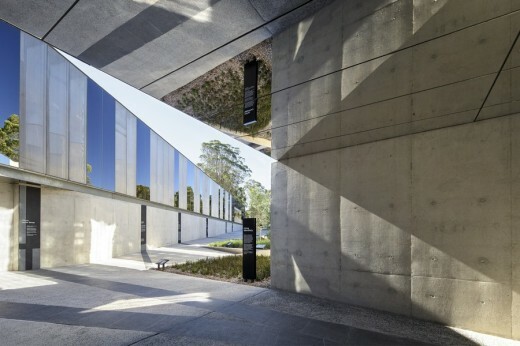 Walking through the Garden is a fundamental way of experiencing the various landscape and built settings and, with the Stolen Generations Memorial adjacent to the site, PlantBank is ideally sited to associate with the weekend visitor’s walking and exploring experience. Hence the overarching architectural approach has been to create a new ‘place’ in the Garden rather than just another building which is shut down after hours. The landscape metaphor is the key to creating this place. 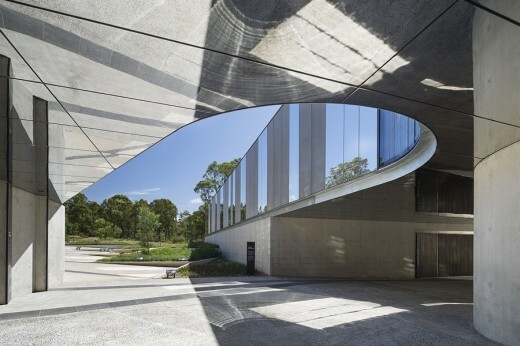 Firstly, the walking track from the Stolen Generations Memorial aligns with the ground level entry to PlantBank; secondly, the ramp and path which lead to the entry continues toward the woodland so that the walker will arrive at the edge of the natural forest; and thirdly the design of the ‘captured’ landscape within the curve of the building contains seating, discrete areas for groups, shade and contemplation spaces. Does the building have a green star rating? 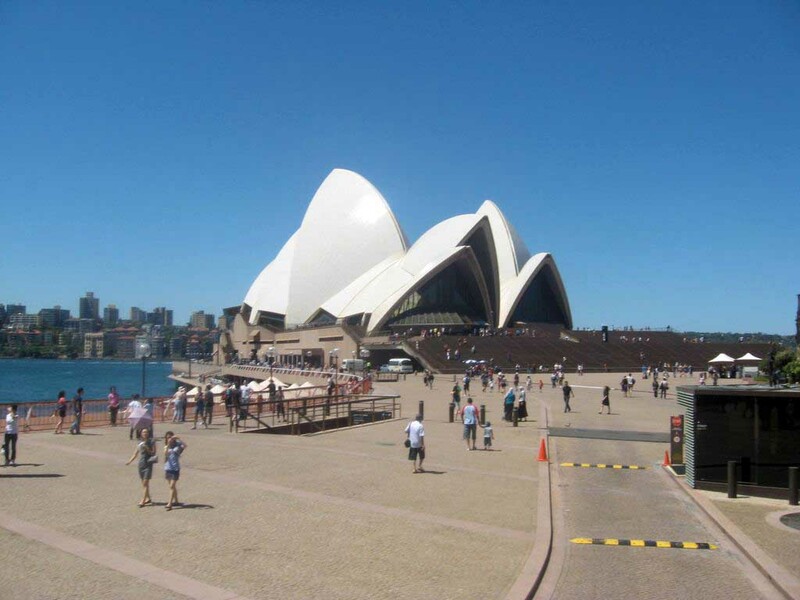 The Royal Botanic Gardens & Domain Trust discussed seeking a Green Star rating with the Green Building Council in the early stages of the project development. 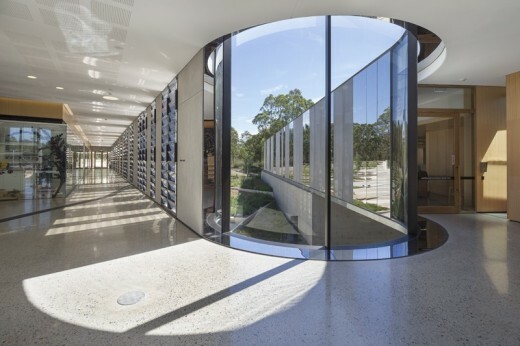 As the Australian PlantBank is a mixture of building functions – including offices, laboratories, museum spaces, etc. – the Green Building Council did not have a rating tool suitable to evaluate the building. Rather than spend in excess of $150,000 to develop a rating tool and document all the necessary information the Trust decided to invest that money in sustainable features such as the thermal labyrinth. Are there solar panels on the roof? • Use materials with low combustibility to address the risk of bush fire from the adjacent Cumberland Plain Woodland. What sustainability features have been included? • Use of thermal modelling extensively to maximise these benefits. 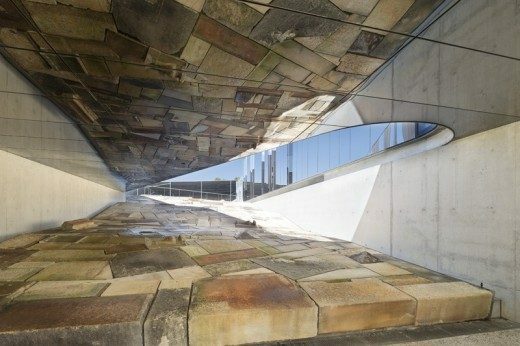 • The building has been designed to be ‘of the landscape’ rather than ‘on the landscape’. 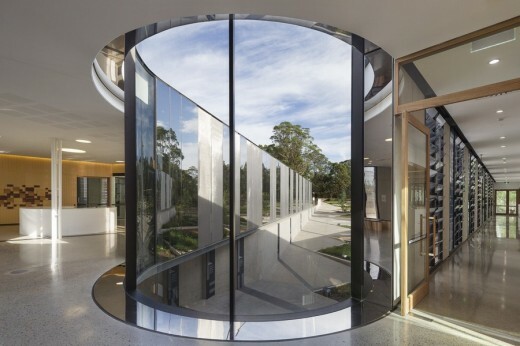 • Materials with low combustibility (to counteract the proximity to the woodland and the risk of bushfire attack), for example, stainless steel mesh has been placed over all opening windows to prevent the entry of embers. Mass construction to moderate internal temperatures, especially floors and ceilings. 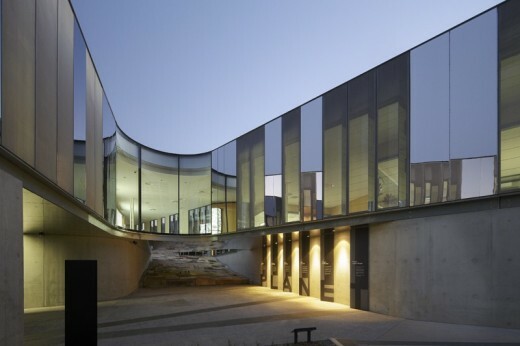 The building’s orientation and form were designed to make the most of the local climate, including prevailing winds, seasonal and diurnal temperature ranges, wind speed and relative humidity. • Mixed mode ventilation in office, laboratory and work spaces for ambient comfort. • Shading of glazed facades to minimise glare and heat. • Automated control for power saving including many motion activated lights especially in the public areas. • Extensive use of skylights throughout occupied areas of the building to introduce natural daylight and minimise use of supplementary lighting. • Sun blades to reflect light, but not direct sun, into the building. • Energy saving devices using time controls and overrides. • Materials have been selected for low fire risk. Why didn’t you build a green roof? 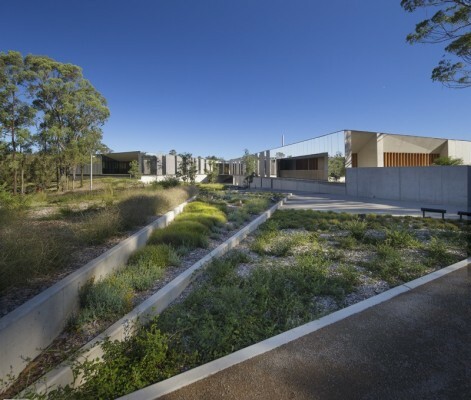 Green roof technology works quite well in places where there are moderate temperatures and frequent rainfall; however, in Western Sydney temperatures can exceed 40°C and rainfall can be infrequent. As an alternative, the project team decided to capture rainfall and redirect it to an underground 100 kL (100,000 litres) water tank. This water is recycled back into PlantBank to flush all the toilets and will eventually water the lichen garden. 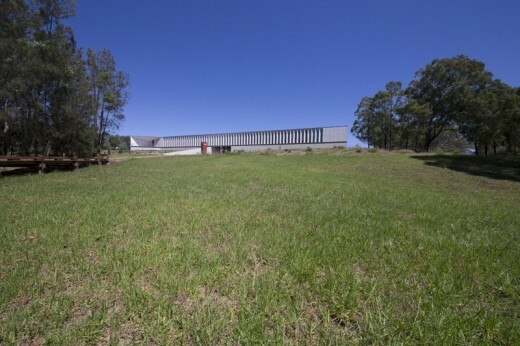 PlantBank’s eastern earthen embankment also acts like a green roof by keeping the lower ground mechanical plant rooms cool. The thermal labyrinth takes advantage of the stable cool environment as an energy saving feature. 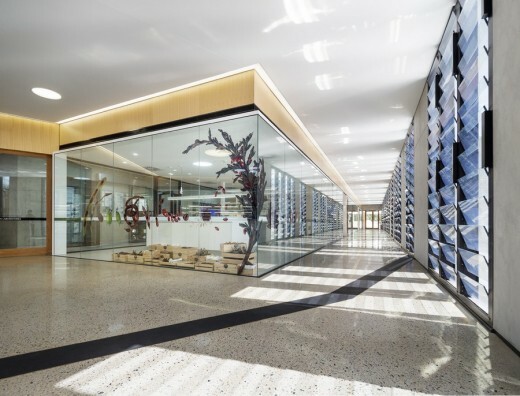 How big is the Australian PlantBank? 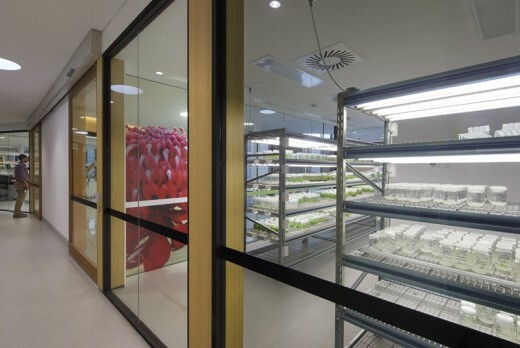 PlantBank consists of about 3000 m² of floor space (or the area of 2.5 Olympic swimming pools) made up of laboratories, the seed vault, a cryogenic store, meeting rooms, a library and office space for staff, as well as a large foyer for visitor engagement.